Check back next week as we calculate the final standings for the 2017 season and see how the players performed that we picked this week. See the bottom of this article for details. After an 0-6 start to the season, Douglass has rallied for two straight wins in district play and can lock up the district title this Thursday at Bluestem. The Bulldogs have scored 110 points in two district games and with a playoff berth on the line, I expect them to not ease up on the gas pedal against a Bluestem defense allowing 43 points per game this season. Dressler is a junior tailback who has taken off the past two weeks, as I think he could be in store for his best game yet this Thursday. Douglass is going to put up a lot of points and my guess is that Dressler will be involved in a lot of those touchdowns. The traditional power Panthers have made a big improvement from a 1-8 mark in 2016 to 6-2 this year. Senior quarterback Trenton Flentie, hurt part of ’16, is a big reason for the change and a top-five ranking in Class 2-1A. On Friday, Centralia (6-2, 3-0) will play host to Jackson Heights (8-0, 3-0) for the district championship and the two playoff spots from District 2. Last week, Centralia pulled out a key 30-22 win against Valley Heights that clinched a playoff berth. Flentie rushed 21 times for 222 yards and two scores, all team-highs. All of the Panthers’ yards came on the ground as Flentie tossed two incomplete passes. For the season, Flentie has helped Centralia outscore opponents, 272-83. He leads the team by a big margin with 117 carries for 1,061 yards and 14 scores. Flentie has rushed for 41 percent of the team’s total yards. He has completed 18 of 42 passes for 354 yards with three touchdowns against four interceptions. Just like last week, expect Centralia to keep the ball in Flentie’s hands often another critical contest. 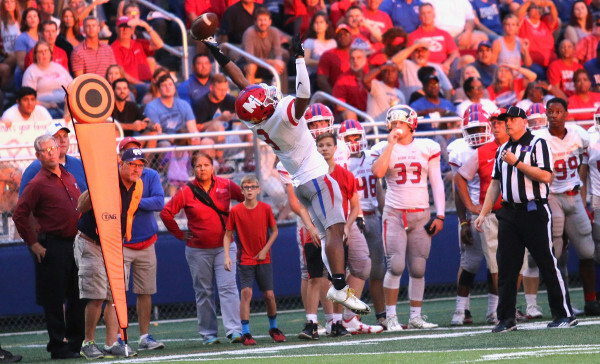 Sophomore Daniel Jackson has stepped in to fill the role of primary receiver in the explosive Bishop Miege offense. Jackson assumed that role from his cousin, Jafar Armstrong, who was an all-state selection the previous the last three seasons and set the Kansas state record for career touchdown receptions. Jackson (6-0, 180) has started his career off with 33 receptions for 812 yards and eight touchdowns. Last week against then No. 2 De Soto, Jackson caught seven passes for 102 yards and three scores. This week, Jackson and the Stags will travel to Spring Hill to take on the 2-6 Broncos. Osage City senior quarterback Tucker Kimball (6-3, 195) has led the Indians to a 6-2 record and a shot at a playoff berth in Class 3A. Kimball has completed 52 percent of his passes this season for 1,682 yards and 15 touchdowns against only four interceptions. He’s also added 363 rushing yards and eight scores as the team’s leading rusher. Kimball has three receivers with more than 375 yards. Senior Peyton Pearson has 22 catches for 409 yards and seven touchowns, while junior Trenton Plinsky has a team-high 24 catches for 395 yards and three scores. Junior Krimzyn Clark has added 18 grabs for 377 yards and two scores. Kimball needs to have a big night at home as the Indians take on West Franklin with the winner going to the playoffs. After opening the season with back-to-back games of 250-plus yards and three-plus touchdowns on the ground, Marten (6-4, 220) has been relatively quiet, topping 100 yards just twice over the past five games. Then again, the Buffaloes’ schedule hit its toughest stretch over that span against district toughies like Burlingame and Clifton-Clyde. In Thursday’s finale, however, Marten will face one of the most porous defenses in Eight-Man Division I in Valley Falls, which has given up 506 points in eight games this season. Last year, Onaga and Valley Falls set a state record for points in a game in a 114-68 Onaga win. An injury which wiped out his entire junior season forced Marten to miss out on the fun a year ago, so he should be chomping at the bit to take his turn. Against lesser defenses Marten has been stellar this year, rushing for 275 yards and 5 TDs and throwing for a TD against Frankfort and following with 250 yards and three TDs rushing and two TDs passing against Wetmore. In his final high school game, expect Marten to hold nothing back as he tries to end Onaga’s season with a victory. Junior quarterback Tyler Trudo had a big week last week in which he rushed for 298 yards on 14 carries and five touchdowns for the Tigers in a win over Ark City. He was also 3 of 3 passing for 65 yards on the night. Trudo is second in 5A rushing this season with 1,123 yards through eight weeks. Since losing their first five games, Ike is on a three-game winning streak as they enter the bracket play this week against Great Bend. The Warriors secured a trip to playoffs with last week's 44-12 victory over Hillsboro, but now they face the stiffest test of district play, and likely their season, with this week's district championship game against Hesston. These two rushing juggernauts in 3A will rely on a stable of quality backfield players. Hesston quarterback Cameron Cox piled up 309 yards rushing in last week's 59-42 win over Southeast of Saline, and running back, and fellow junior, Parker Roth went over 200 on the ground in the game. Marion's offense goes through option quarterback Chase Stringer and running backs Jack Schneider (the former starting quarterback as an underclassmen) and Corbin Wheeler. The Warriors have piled up rushing yardage in their two district wins, most notably in the district opener over Southeast of Saline where Schneider rushed for 195 and three TDs, and Wheeler churned out 290 yards and five scores on just 17 carries. This game has all the makings of an epic district clash, and any one of the talented skill players on both sides of the ball could have a huge game, but proven senior Corbin Wheeler will be looked upon to lead the way. White (5-10, 165) has been one of the top dual-threat quarterbacks in Class 3A all season. The senior quarterback has passed for 1,235 yards and 11 touchdowns with seven interceptions, but he’s done more damage on the ground. White has amassed 1,315 rushing yards and 25 touchdowns on his 209 carries this season. He’s averaging nearly 165 yards rushing per game and more than six yards per carry. White and the Trojans can’t qualify for the playoffs after consecutive district losses, but look for the senior to go out with a big game against one-win Hillsboro.